Scotland has got plenty of 'em. I actually think I might have overdosed on waterfalls at one point, since my inclination is to stop and take a picture whenever I see one. That quickly got old when I was driving through the Highlands. 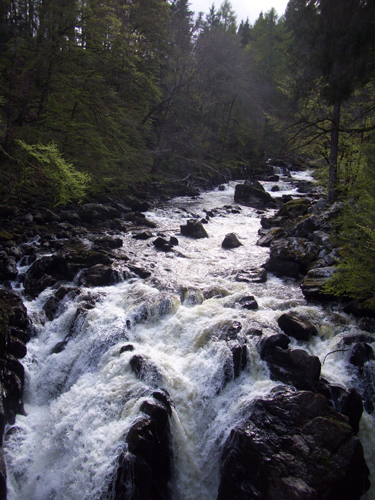 This particular waterfall is at a place called The Hermitage near Dunkeld. Now, here's the thing, I'd been to Dunkeld a couple of times because it has the Best Beer Garden in Scotland (my words). People had told me about The Hermitage, but, with a name like that, I figured it was another old church. Now, don't get me wrong, I love me some old churches, but, as with waterfalls, in Scotland they're pretty common. So I never bothered to go to The Hermitage. the National Trust, which owns the property, so I figured that I'm paying for it, might as well see what I get for my money. They wanted you to "pay and display" at the car park. Right. This was Saturday at 5pm. Wasn't going to happen. Plus I was saving my money for a beer for the road a the Best Beer Garden in Scotland. The walk to the falls was about 1/4 of a mile. Which, I guess sounds like a long way for most Americans. But I'm used to walking now, so I knew that 1/4 of a mile is only about 5 or 10 minutes. The path to the falls was nice. The area has been planted with a bunch of Douglas Firs imported from - where? - that's right, the good old US of goddammed A. The whole area had a very Northern California feel to it. After my short walk alongside a rapidly flowing stream, I reached the waterfall. And...dizzzzaaaammmmmm. Take a look at the picture again. You see that little, hut thing in the upper left? Those are people out there on the balcony. I'm not sure what that little house was for. There were some kind of engravings on the wall inside. Ahhh. Okay. That building is called Ossian's House of Mirrors. Apparently mirrors used to run along the inside of the building so that it looked like you were standing in the middle of the waterfall. In the late 1800s (according to my sources), vandals BLEW UP Ossian's Hall of Mirrors. Man. Who blows up a Hall of Mirrors? Seriously. People are always bitching about uncooth Americans, but I don't think we've ever blown up a hall of mirrors. That's some kind of vandalism. They didn't just smash the mirrors, like ordinary vandals, they used explosive charges. That just makes me wonder if there is something going on beneath the surface here. A Perthshire revolutionary movement? Maybe they were Luddites?!! Very mysterious indeed. I'll have to do some more research on this. Sorry, no pictures from inside Ossian's Hall. I just thought it was a shed and didn't realize the historical implications.